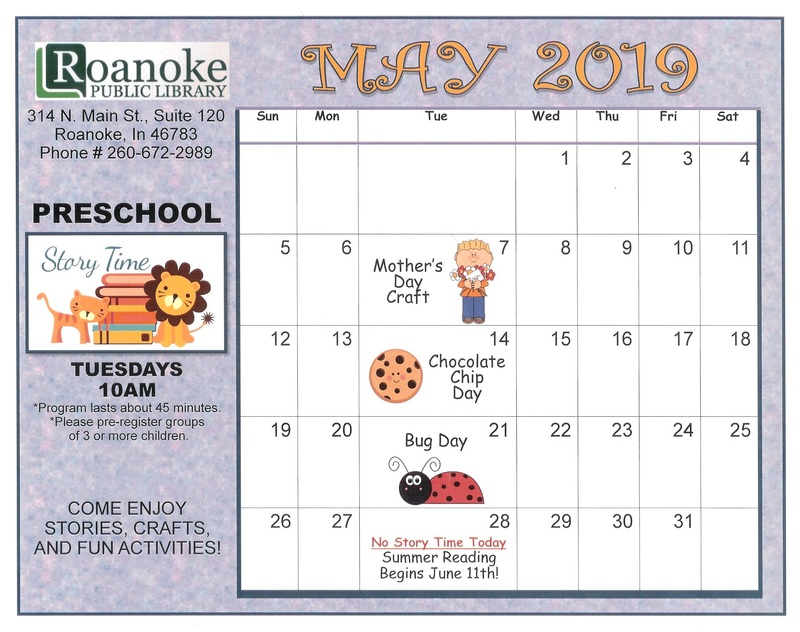 A: Name: The official name of this board shall be the Board of Trustees of the Roanoke Public Library, hereinafter referred to as “the Board”. B: Organization: The Board is a Class One Public Library operating under the Public Library Law of 1947 and the Library Services Authority of 1967 of the State of Indiana. The Board exercises the powers and authority and assumes the responsibilities delegated to it under the provisions of IC 36-12-1-5. C: Mission Statement: Providing access to knowledge and information to inform, educate, entertain and serve. D: Library Description: The Roanoke Public Library is located in the town of Roanoke, Indiana in Huntington County. The library district is the residents living within the city limits of the town of Roanoke, Indiana. 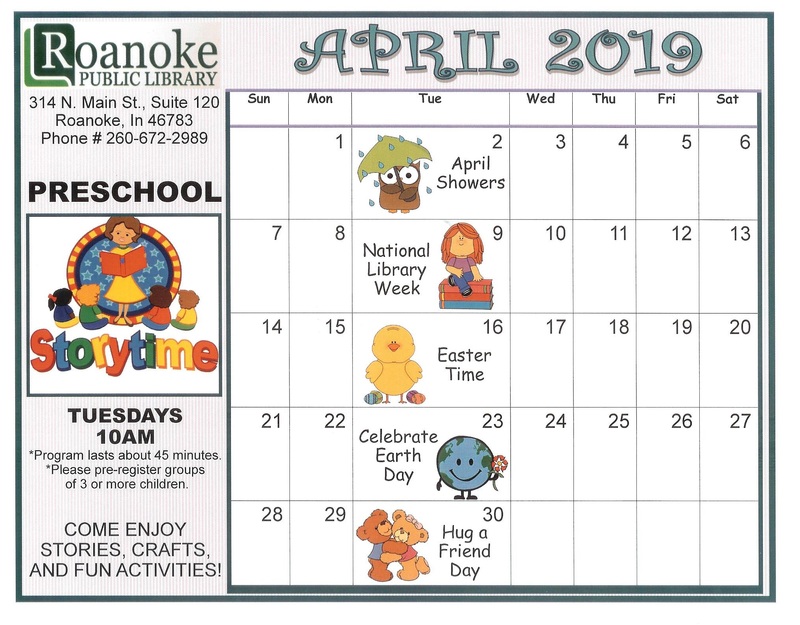 The physical address of the Roanoke Public Library is 314 N. Main Street Suite 120, Roanoke, IN 46783 with a mailing address that includes PO Box 249. · TECHNOLOGY AVAILABLE: 6 patron computers, 2 printers including 1 color one, 2 copiers including 1 color, 1 scanner, and 1 fax machine. F: Materials Available: access to over 3.5 million bibliographic records which in turn provides access to over 5.5 million items thanks to being part of the Evergreen Indiana Consortium. A: The Board shall govern and set written policy for the library. It has the power to make all rules and regulations for the discharge of its responsibility. 1. Insure the purchase of books and other materials in order to provide access to same by residents of the library district (IC 36-12-3-6). 2. Monitor and evaluate overall effectiveness of the library. 3. Establish and oversee the appropriations and expenditure of library funds and moneys. 6. Plan for the future of the library including oversight of facilities and programs. 7. Be an advocate for the library in the community and advocate for the community to the library as a Board. 1. Govern and set written policy for the library. The Board has the power to make all rules and regulations for the discharge of its responsibility. The Board shall govern the Library, a municipal corporation and Class C library organized under the public library provisions, according to the purposes and authority set forth in IC 36‐12, as amended, and such other Indiana and federal laws as affect the operation of the Library. 3. Planning for the future of the library; which shall include establishment of the budget and oversight of facilities and programs. 4. Monitor and evaluate overall effectiveness of the library. 5. Being an advocate for the library in the community and advocating for the community to the library as a Board. B: Compensation: Members of the Board (Trustees) shall serve without compensation, except that the Treasurer may be paid, per IC 36‐12‐2‐21. A Board member may not serve as a paid employee of the public library. C: Travel: Necessary travel and/or meal expenses of any Board member incurred in the interest and business of the library may be reimbursed out of library funds, per policy or board resolution. Such travel on behalf of the Library shall be approved by the Board. D: Legal Counsel: The Board may engage legal counsel as needed for legal advice. The President of the Board or the library director may request the legal opinions of legal counsel for any matter which comes within the jurisdiction of the Board, and shall report the opinion to the Board. E: Attendance: Board members are expected to attend all meetings of the Library Board. F: Library Laws: Board members are expected to become familiar with state and local laws as they pertain to public libraries. G: Appointments: The Board of Trustees of the Roanoke Public Library shall consist of seven members. The application, appointment, term reappointment and removal of trustees shall be in accordance with Indiana Law. H: Term: Trustees shall serve a four-year term commencing on January 1 of the year following the appointment. Trustees may serve up to four consecutive terms. 1. If a member is absent from six consecutive meetings, said member’s seat will be reassigned by the appointing body. a. Inform the community and the appointing agency of the vacancy. A: Meetings: The Board shall meet at least monthly at a regular specified time, and at any other times a meeting is necessary. Members are expected to attend and participate in all meetings and see that accurate records are kept of such meetings. B: Open Meetings: Except as provided in IC 5-14-1.5-6.1, all meetings of the Board must be open at all times for the purpose of permitting members of the public to observe and record them. C: Special Meetings: Special meetings may be called by the president or upon the request of two or more board members. Notification shall be given to all board members prior to the special meeting occurring. D: Executive Sessions: The Board may hold an executive session as allowed by IC 5-14-1.5-6.1. E: Notice: Notices of all Board meetings shall be in accordance with IC 5-14-1.5-5. 48 hour notice (not including Saturday, Sunday and legal holidays) for all special and committee meetings is required, meeting dates, place and times must be posted and all media who have requested notice notified. All media who have requested notice will at the beginning of each year be notified as to the time, place and dates for all regular meetings. A 48-hour notice shall be given to the media and posted where the date, time or place of a regular meeting or meetings is changed. F: Quorum: For all Board meetings, four (4) members shall constitute a quorum. G: Majority Vote: An affirmative vote of the majority of all Board members present and voting shall be necessary to approve any action before the Board. H: Conduct of Meetings: Meetings shall be conducted according to Robert’s Rules of Order. The Board shall elect annually a President, Vice-President, Secretary and Treasurer. Elections shall be held in December. The term of office shall begin January 1 and conclude on December 31. The Board shall elect a successor if a vacancy occurs in any office. A: President: The president shall preside at all Board meetings, appoint all standing or special committees and the committee chair, execute documents authorized by the Board and perform other duties normally associated with the office or assigned by the Board. The president shall, in conjunction with members of the Board, prepare and mail the agenda of each month’s meeting at least one week before each scheduled Board meeting. B: Vice-President: The vice-president shall preside over meetings in the absence of the president, perform the duties of the President as Acting President in the case of the vacancy of the presidency, until a president shall be elected and shall perform such duties assigned by the President. C: Secretary: The secretary shall oversee minutes taking and correspondence done by the library staff on behalf of the Board. Minutes will record the following: date, time and place of meeting; members present; general substance of all matters proposed, discussed or decided; results of votes taken. A memorandum of the meeting shall be available at the library, within a reasonable period of time following the conclusion of each regular meeting. The minutes of the meeting shall be sent with the next meeting’s agenda to each Board member. The minutes will be approved at the next meeting of the Board. The official papers and correspondence of the Board shall be in the custody of the Library. D: Treasurer: The Treasurer shall sign checks, assist in the audit of library financial records, assist in preparing monthly financial reports and in presenting the monthly financial report at each Board meeting. The Board treasurer shall be the assistant secretary and act in the absence of the secretary. A: Committees shall be formed and continue until completion of the charge or until dissolution by Board action. Each committee shall generally consist of three members appointed by the President. Committees shall act in advisory capacity unless authorized by the Board to take specific action. Notice of all committee meetings shall be in accordance with IC 5-14-1.5-5. Director: The Director of the Roanoke Public Library shall possess an Indiana Library Certification Level V or above. The Director as advisor to the Board and committees shall, unless excused, attend all meetings and take part in all deliberations but shall have no vote. The Director, as the administrative head of the library, shall be responsible to the Board for the operation and management of the library. The Director shall also act as advisor to the Board and its committees. The Board shall maintain a current written job description for the Director, which sets forth, in detail, the role of the Director. The Director shall be responsible for administration and management of the library, with direction and review by the Board. The Director shall administer the policies adopted by the Board, with responsibility for hiring, directing and supervising personnel, and recommending such policies and procedures as will promote and improve the service of the library. The Board shall provide for adequate professional and supportive staff needed to perform the library’s mission and service responsibilities. Standards shall be set for each position, which comply with Indiana Library Certification law and recommendations for Library personnel practices made by American Library Association. The Board shall maintain a current salary schedule for compensation based upon job classification, grade, step, and educational requirements. Library staff shall be provided with a job description as approved by the Board. As needed, the Board may retain consultants for matters dealing with legal questions, procedures, building development or other purposes necessary to carry out the Board’s plans and programs. In compliance with Indiana Law, dependents of the Director and/or Library Board of Trustee members are ineligible for employment with the library. In addition, no immediate family member of a current staff member will be considered for a position wherein one member would have supervisory duties over the other. Each case of second family member applying for a position which is not covered above will be judged individually. If a relative relationship is established after employment, the individuals concerned will decide who is to be transferred. If no decision can be made within 30 calendar days, management will decide. For purposes of these bylaws, a relative is any person who is related by blood or marriage, or whose relationship with the employee is similar to that of persons who are related by blood or marriage. No “presumption of guilt” is created by the mere existence of a relationship with outside firms, however, if such board members/employees have any influence on transactions involving purchases, contracts, or leases, it is imperative that such is disclosed to their fellow board members in the case of a board member or the director in the case of an employee immediately, so that safeguards can be established to protect all parties. Personal gain may result not only in cases where a board member/employee or relative has significant ownership in a firm with which the Roanoke Public Library does business, but also when a board member/employee or relative receives any kickback, bribe, substantial gift, or special consideration as a result of any transaction or business dealings involving the library. Amendments to these bylaws may be proposed at any meeting of the Board if included in the published agenda. Voting on any proposed amendment to the bylaws will occur at the next regular meeting following the proposal. Proposals to be adopted will require a 2/3 majority of all Board members. Reviewed and revised 11/10/03. Reviewed and made no changes 11/15/04. Reviewed and revised 4/13/2010. Reviewed and revised 2/16/2011. Reviewed and revised 9/21/11. Reviewed, revised and updated 10/28/2014, reviewed 11/28/16.Reviewed 11/27/17. Reviewed 11/27/18. It's Monday 6:14 PM — We're open . Come visit us.